Explore Downtown Salt Lake City. Feel at home in the spacious and comfortable studio, one and two-bedroom suites of the newly renovated Homewood Suites by Hilton® Salt Lake City-Downtown hotel. 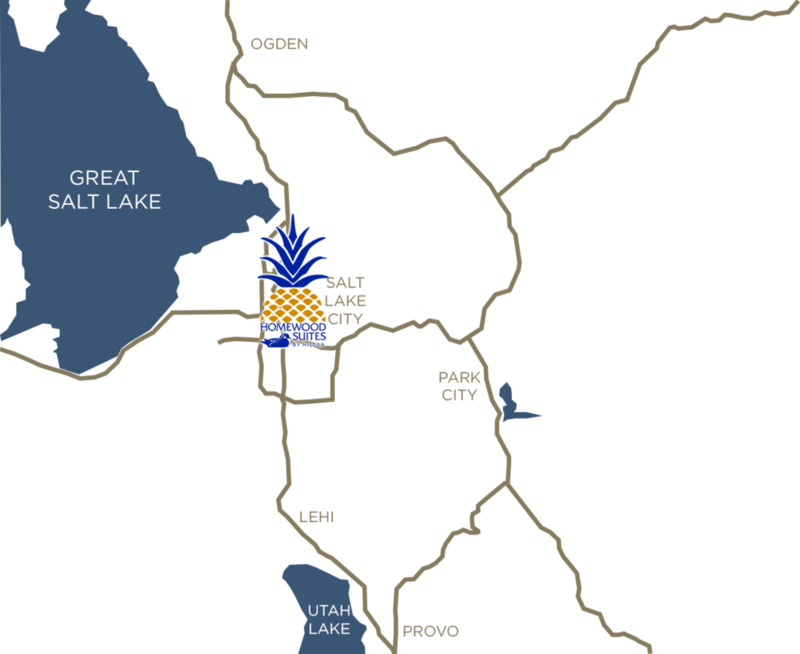 Located in the Gateway area of Salt Lake City, Utah, we are close to attractions such as Temple Square, Great Salt Lake, Hogle Zoo, Park City and The Canyons Ski Resorts, Lagoon Amusement Park, Red Butte Garden and This Is the Place Monument. Discover shops, restaurants and theaters at Gateway Center, one block from our Salt Lake City hotel. Attend a concert at Vivant Smart Home Arena, two blocks from our extended stay hotel. The Salt Palace Convention Center is three blocks away. Guests can dive into our seasonal heated outdoor pool, unwind in the whirlpool open year round, or workout in the fitness center. Lounge in one of our studios or one and two-bedroom suites with separate living areas, each featuring sofa beds and 32-inch flat-screen TVs with premium cable channels. Prepare dinner in the fully equipped kitchen. Find plenty of space for working, relaxing and entertaining. Stay connected with WiFi access in each suite. Choose a venue from meeting rooms measuring up to 1,400 sq. ft. and utilize our available business center services. Wake up to a hot full breakfast daily, and unwind at our evening social with light fare and drinks*, served Monday through Thursday. Both are included with your stay.